I had the pleasure to meet Edgardo Griffith, Heidi Ross and the more than 60 species of frogs they care for at El Valle Amphibian Conservation Center. If El Valle Amphibian Conservation Center is a frog lover’s heaven, then Edgardo Griffith and Heidi Ross are the center’s angels. With more than 60 frog species at the facility, more commonly known as EVACC, I was spellbound, moving from tank to tank like a kid in a candy store. From the horned marsupial frog (Gastrotheca cornuta) to the crowned tree frog (Anotheca spinosa), each animal was sweeter than the next. Brian Gratwicke, the project’s international coordinator, and Jeff Coulter, a project volunteer, and I drove the two hours yesterday from Summit Zoo to western Panama to visit EVACC. EVACC acts as another ark as part of the Panama Amphibian Rescue and Conservation Project, housing about 10 of the rescue project’s priority species. What do frog lovers drive? Why a golden frog mobile, of course! 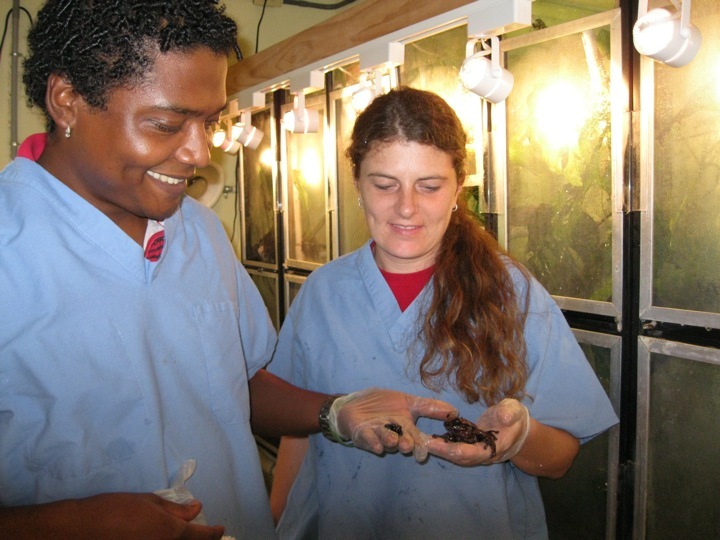 With only one other person to help them, Edgardo and Heidi care for all of the frogs on their own, every day of the week. While I was running around trying to say hello to each frog, they were moving through spot checks and misting the tanks, pausing only to proudly show me the newest tadpoles or metamorphs among the crew. 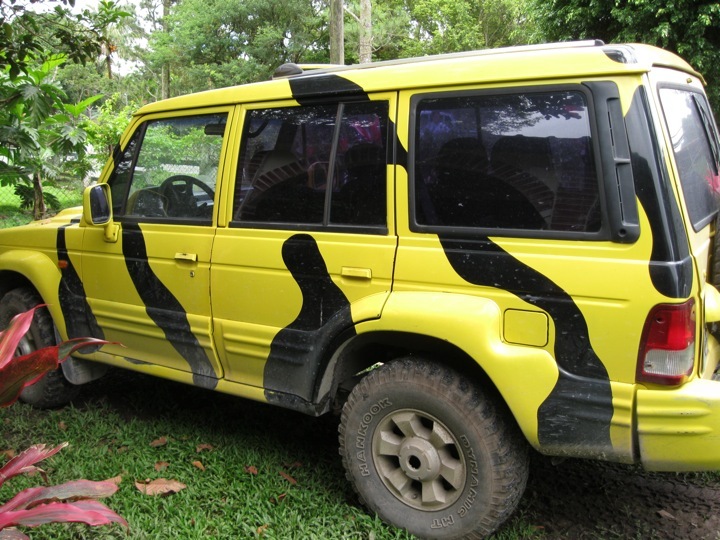 The two biologists live for frogs—they have a car painted like a Panamanian golden frog (Atelopus zeteki) and a toilet top with the same pattern. Edgardo and Heidi’s outward love of these frogs is also a symbol of just how valuable a treasure they have at EVACC. 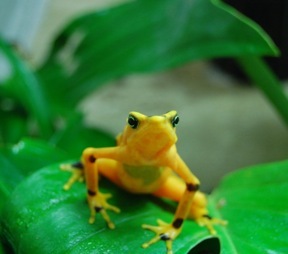 The center houses the only population of Panamanian golden frogs—the country’s national animal—left in Panama. Panamanian golden frogs are extinct in the wild, found only in captivity at EVACC and a number of zoos and aquaria in the United States. Yet Panama still celebrates the golden frog and markets are filled with statues and artwork aimed at capturing these animals’ beauty. My suitcase will be overflowing on my trip back to the United States tomorrow. 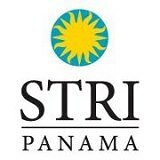 I was reminded last night of how revered Panamanian golden frogs are in their native country when the owners of the restaurant we were at came out and offered us free cocktails and dessert in gratitude of the work that Heidi and Edgardo do at EVACC. To be part of a society for a week that actively cherishes frogs is something that I get to carry with me to the United States, where I aim to inspire the same type of interest in the rescue project. I will also carry with me the memory of our hike today up to the top of Sleeping Indian Mountain in El Valle. Brian told me that this spot would have once been teaming with Panamanian golden frogs, lined up and down the sides of the stream. I didn’t see a single frog on the five-hour hike today, in fact, though Brian says that there are red-eyed tree frogs and tungara frogs a-plenty. I would imagine that such a sight today would be far more heartbreaking for anyone who remembers what it should be like and is faced with the grim reality. While I didn’t get to spot any golden frogs in the wild myself, I’m proud to be part of a project that could be responsible for filling the streams with gold once again someday.